Actress Brooklynn Prince poses for a portrait in New York to promote her film, "The Florida Project," Nov. 28, 2017. Seven-year-old Brooklynn Prince is sitting in a darkened TV studio with lights, cameras and control panels all around her. "Mission to Mars, mission to Mars," she says. "This is Apollo." Brooklynn, the cheerful star of "The Florida Project," has indeed lifted off. Her performance as Moonee, a brash, trouble-making pipsqueak living with her mom (Bria Vinaite) in a low-rent Orlando motel, may be the most spirited thing of 2017. Brooklynn is the exuberant energy at the center of one the year's most acclaimed films, and some believe she should be the youngest Oscar nominee ever. Brooklynn included. "I really want to be nominated," she says. "Even if I get close to nominated, that's a real honor." But she'd also — maybe even more so — really like to meet Emma Watson and Elle Fanning. "They have been my girls for years," she says. None of the year's breakthrough performers has enjoyed their moment more than Brooklyn. She has shot a selfie with Gary Oldman, shaken hands with Adam Sandler and met Margot Robbie, whom she confirms was "super-duper nice." "I never thought I would have this chance," Brooklynn says. "It's this crazy little movie that's everywhere." 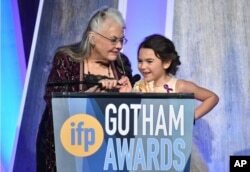 Actors Lois Smith, left, and Brooklynn Prince present at the 27th annual Independent Film Project's Gotham Awards at Cipriani Wall Street, Nov. 27, 2017, in New York. She has Instagramed, Snapchatted and tweeted her adventures, from the Cannes Film Festival to the recent Gotham Awards, by borrowing her parents' phones. She carries pins for homeless awareness with her to give away as a way to magnify the message of "The Florida Project." "I've always said: It doesn't matter how small you are or what age you are to change the world. You can get into the business anytime. I was two when I got into the business," says Brooklynn, the veteran. "Now I know that this is really what I want. My mom and dad aren't pushing me for this. It's what I want. Acting is, like, my life and I want to keep doing it forever."